Unfortunately the "Ferrero Rocher Chocolate Giveaway" offer is no longer available. 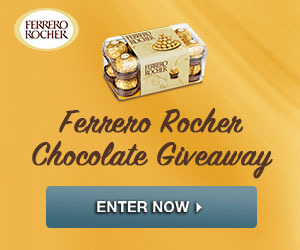 There are 50 boxes of Ferrero Rocher Chocolate up for grabs in this Ferrero Rocher Chocolate Giveaway. Enter today for a chance to win your free box! Giveaway ends 11/1/17. Good luck!